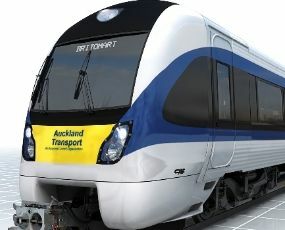 CAF has signed a contract to supply 57 Electric Multiple Units (EMU) for the city of Auckland in New Zealand. Also, the contract includes the maintenance for the EMUs for a 12 year period. The contract amounts to approximately €300 M and deliveries are to start in 2013. These EMUs for KiwiRail are made of 3 cars, two cabbed end motor cars and one trailer intermediate car, with a total capacity for 380 passengers. Car structure is made of stainless steel. Each carbody has two passenger access doors per sidewall. Besides, the intermediate car is low floor type providing ease of access for Persons with Reduced Mobility and wheelchairs. Interior and exterior displays, loudspeakers, and systems and intercom for passengers with hearing aids. Interior cameras, front cameras and rear-view cameras. Communication with ground facilities for downloading of data via WiFi and mobile telephony. Passenger counting system to provide KiwiRail with the exact number of carried passengers as well as the number of alighting and boarding passengers in each station. In addition, passengers can connect to Internet by the onboard WiFi. The train includes the required systems to reach the highest safety standards in the industry: ERTMS, DVS, event recorder and ground-train radio.